Sister Evelyn died on January 14, 2019 at the age of 99. She enjoyed her 80th Jubilee celebration with family and friends in May 2018. Pauline was born in Unity, Saskatchewan. She was the oldest in a family of 11 children. Her parents George and Magdaline (Senger) were born in Odessa, Russia. Pauline had a great love of nature, delighting in the animals, birds and flowers. She loved horseback riding. At age 10 she would ride alone to get 30 head of cattle. The distance being three miles. When she was 12, she and her brother helped her father work the land. As a youngster, she desired to be a sister. After completing Grade 8 at Denzil Public School, her parents, along with parents of a friend, visited Notre Dame Convent in Leipzig. Shortly afterward Pauline and Mary Bartsch went to the convent school in Leipzig. In November 1934 they traveled to Waterdown. Pauline was received as Novice Mary Evelyn in 1937 and professed her vows in 1938. Sister Evelyn was a talented artist. She assisted Sister Gertrude Schnitzler with sacred paintings for St. Thomas Church, Waterdown and Our Lady of Mount Carmel Church, Freelton. She also painted sacred images on fabric for the needlework department, which prepared liturgical vestments and altar linens. She was receptionist at Notre Dame Convent until 1959. Boarders at Notre Dame Academy recall her warm welcome when they returned from their homes on Sunday evenings. From 1959 – 1964 Sister Evelyn was sacristan at the Cathedral of Christ the King, Hamilton, where she also taught art. In 1964 she moved to Welland. Here she continued teaching art to children and adults. She encouraged her students to express their inner feelings in creative forms of art. She advanced her own artistic skills by taking art courses. Her entry in the Welland Rose Art Festival with the theme Grandmother’s Treasures won first prize. Frequently, her skill at calligraphy was commissioned to design cards and posters for special occasions. In 1978 she returned to Notre Dame Convent, where she was assistant local leader. During that time her younger sister Beatrice, also an SSND, died in 1979. Beginning in 1982, Sister Evelyn became involved in pastoral ministry in Aroland and in Saskatchewan, Saskatoon and Kerrobert. While in Kenora from 1990 – 1995, Sister Evelyn was an active member of the Kenora Artists Association. The local newspaper published an article on Sister Evelyn – Profile of An Artist - entitled Sister Evelyn Extremely Creative. While in Kenora, she attended the workshops on Native Spirituality Ministry. While living at St. Anne’s Convent, Kitchener, until it closed in 2001, Sister Evelyn was a volunteer for RAISE (Retirees Assisting In Serving Each other). On leaving, she received a letter of appreciation for her visits to the seniors who were living independently in their own homes. She then moved to Waterdown, where she continued to share her artistic gifts with others. 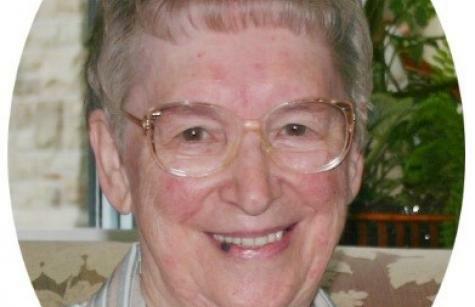 Sister Evelyn is remembered for her gentle, loving nature. Mass of Christian Burial for Sister Evelyn Volk was celebrated on January 19 at Notre Dame Convent, Waterdown. The presider and homilist was Rev. Wayne Lobsinger, Episcopal Vicar for Consecrated Life for the Hamilton Diocese. Concelebrant was Rev. Pablito Labado, Chaplain. She is survived by her sisters, Evelyn Botham, Anne Brin, Marjorie Tiffin, Patricia Ackerman, Marlene Pulak and Janet Putman. Her sisters Marlene and Janet were with Sister Evelyn during her final days.